There’s an old proverb that states: “Shared joy is doubled joy.” While this is indeed true when it comes to things like candy and laughter, it can just as well be applied to shared web hosting. Shared hosting is an inexpensive and simple way of making a website available online, regardless of your experience with web hosting. Especially if this is your first time creating a site, shared hosting is often your best bet. DreamHost has been a top-notch hosting company for more than 20 years, and we offer a shared hosting plan that can be a great help when trying to get your new site off the ground. In this quick-start guide, we’ll take you through the benefits of using shared hosting and explain why DreamHost’s plan is such a solid choice. We’ll also show you how to get your website going and even offer a list of resources that can help you learn more. Let’s get to it! In case you’re unfamiliar with the jargon involved in web hosting, let’s start from the top. A web host is a company where you can buy server space to store your website. This is how your site becomes publicly available. When a visitor tries to access your site, all the necessary data is sent from the web server to that visitor’s device. This is all pretty straightforward. However, things do get slightly more complicated when you start to consider the different types of web hosting. There are many varieties, and they differ in how they’re set up, what resources they provide, and more. In this post, we want to take a close look at shared hosting packages. As the name suggests, this is a type of hosting where your site shares a server and resources with a multitude of other users. For this reason, shared hosting is usually the least expensive option. What’s more, it comes with a number of key benefits. For one, shared hosting is usually aimed at beginners or those who don’t want to spend too much time on the technical aspects of hosting. As such, these plans will generally be easiest to set up and manage. This makes shared hosting perfect for smaller sites, such as blogs or portfolios that don’t require a lot of upkeep. Here at DreamHost, we offer our own shared hosting plan. It has been specifically tailored to be as easy as possible to get started with and use. We’ll get into the finer details soon. If you’re looking for a simple and painless way to get your website off the ground, however, suffice it to say that DreamHost has you covered. Of course, we’d be remiss not to mention that we also offer a number of other plans. Large, complex sites sometimes require more robust hosting services. If that sounds like you, then you might want to check out our managed WordPress hosting, VPS hosting, dedicated servers, and WooCommerce hosting. If shared hosting sounds intriguing, however, read on for all the details. 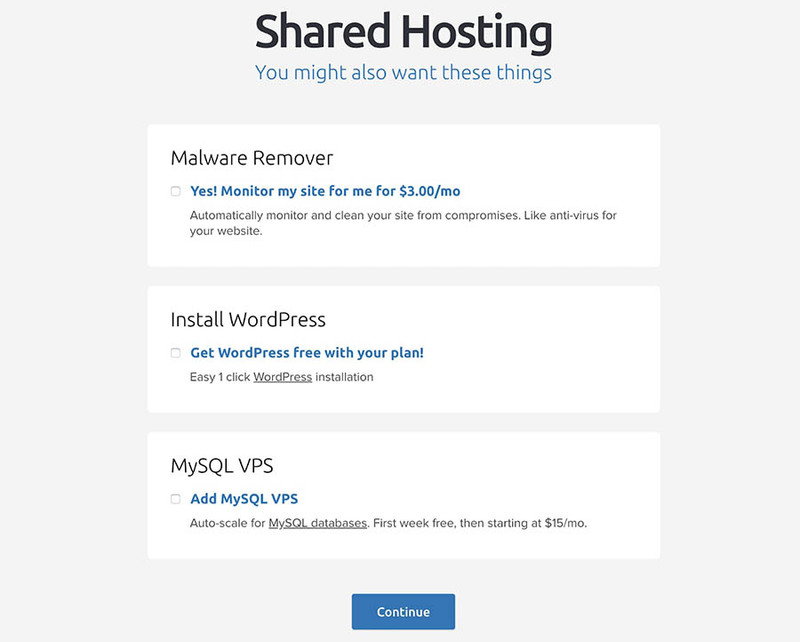 The DreamHost shared hosting plan contains everything you need to get your site online. This plan is specifically tailored to make it easy and fast to sign up and publish a site, even if you have no prior experience. Includes one-click WordPress installations. This means you can install WordPress on your site in seconds, with a single click. While you don’t have to use WordPress on our shared hosting plan, we highly recommend the platform, especially if you’re new to building and running a website. Guaranteed 100% uptime. Our servers are reliable, and we promise that your site will be too. If your site is ever down, we’ll give you a day’s free service for every hour of interrupted service. Free SSL security and privacy. We don’t charge extra to protect your data, and to make sure your site is secured. Access to 24/7 award-winning support. Regardless of when you have an issue or need assistance, our support team can help you out. Unlimited hosting. There’s no limit on the amount of data you can transfer or the number of files you can store on our fast SSD hard drives. You can also use as many domains as you want. While we’re confident that you’ll enjoy shared hosting with us for these reasons and more, we do offer a 97-day money-back guarantee. You can therefore feel safe and secure in giving us a shot, and see for yourself if we live up to your expectations! 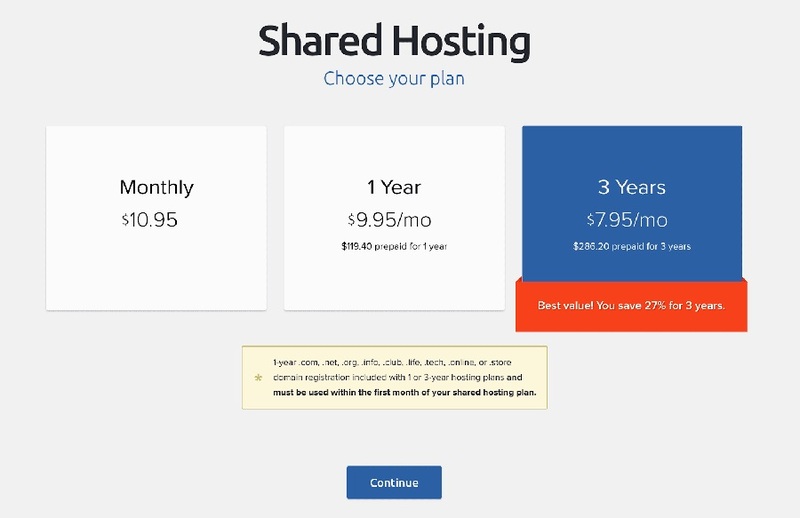 By now, we’ve covered many of the reasons our shared hosting plan can benefit your site. At this point, you’re probably itching to get started. We won’t keep you waiting any longer! 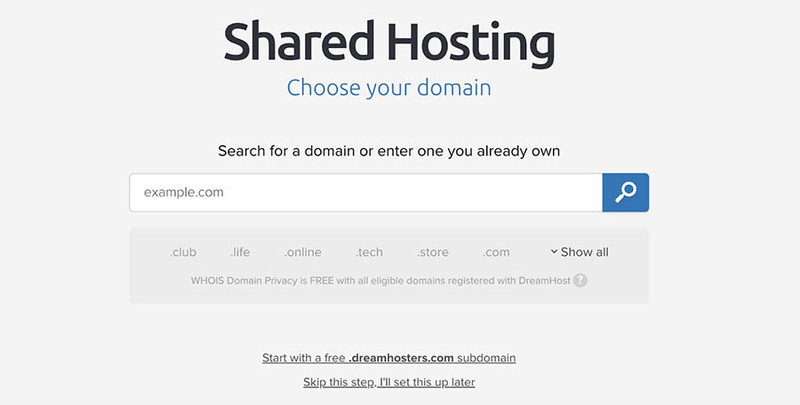 Let’s walk through the process of signing up for shared hosting here at DreamHost. The first step of the process is also the simplest — creating a DreamHost account. 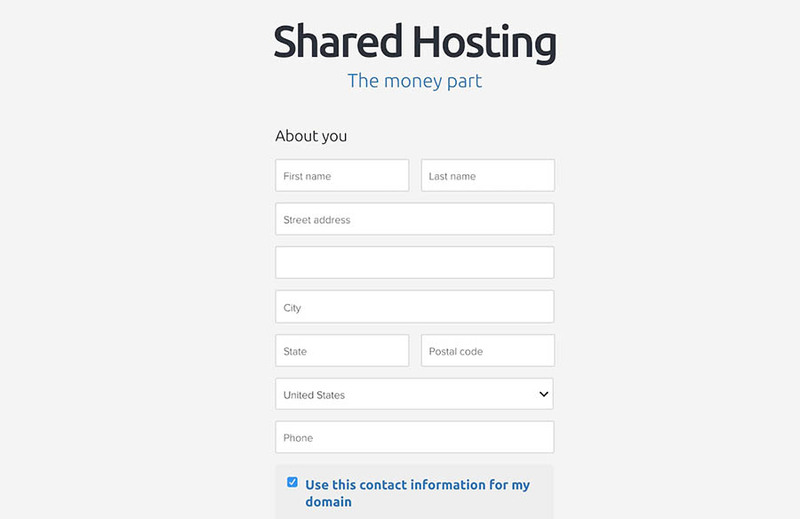 You can do this from the shared hosting landing page, by selecting Buy Web Hosting. When you do this, you’ll be taken to a setup wizard. You may notice the bar at the top of the page. This shows how the signup process is neatly separated into steps, which we’ll go through one by one. All you need to do on this page, however, is enter your email address and provide a password. Make sure the latter is as strong as possible. Once you’ve done that, select Continue to move on to the next step. 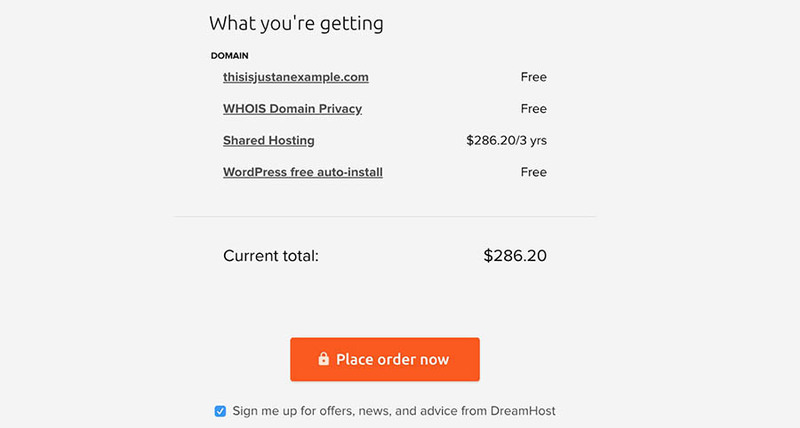 All DreamHost shared plans come with a free domain name included. If you’re unfamiliar with the term, your domain name is the URL used to access your website. For example, if you chose the domain name justanexample.com, you could use https://www.justanexample.com to visit your site. After you’ve added your account details in the previous step, you’ll be able to search for and select a domain. Enter the domain you want into the field, and click on the magnifying glass icon to perform a search. If the domain is already registered for another DreamHost site, you’ll see the following message. However, if the domain you want is not available, but isn’t registered with DreamHost, you’ll see a message asking if you own it. By scrolling down, you’ll see a list of recommended alternatives. Finally, if the domain you searched for is available, you’ll be given the option to add it to your account right away. 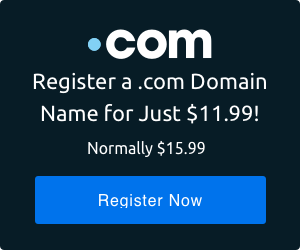 Once you’ve found a domain name you like, click the Register Now button to add it to your cart. If you want to skip this step for now (you can always add a domain later), you can do so with the link below the search function. Regardless of which option you selected, you will be taken to the next stage of the signup process. It’s finally time to choose what plan you want to get. 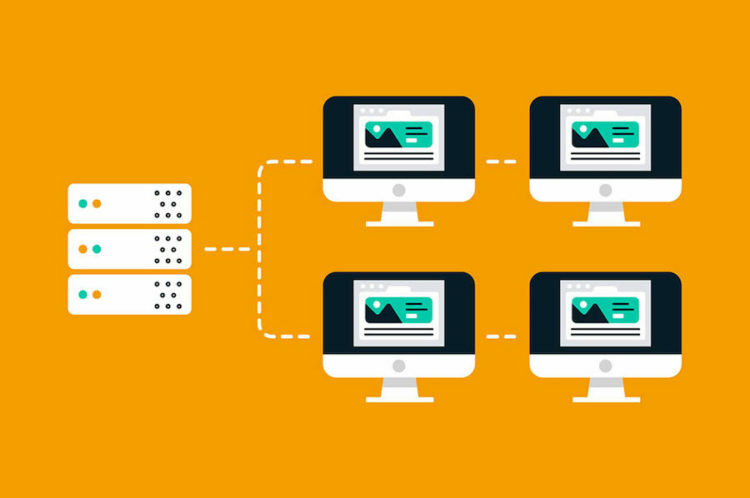 When it comes to shared hosting, you’ll be able to select one of three options. Which payment plan you choose is entirely up to you. You can either decide to pay monthly or go with a prepaid option of either one or three years. You might prefer the flexibility of paying on a month-by-month basis, but the yearly plans do offer an overall better value. Once you’ve selected a plan, click on Continue again. This will take you to the next step. As an award-winning hosting provider, DreamHost is all about making sure you always have everything you need. With that in mind, this step enables you to add some extra options to your hosting plan. While these features are not necessary to get your site off the ground, they will help you secure your site, and can make managing it significantly easier. Malware Remover: This adds automatic protection for your site against malware. The term ‘malware’ is short for ‘malicious software,’ and refers to any program that can attack, infect, and harm your site. Adding our Malware Remover is effectively like installing anti-virus software for your website. Install WordPress: Select this option if you want to be able to install WordPress on your site with a single click. While the process of installing WordPress is already fairly simple, we’ve made it even easier. Plus, this feature is completely free. WordPress Migration Service: This option only appears if you select Install WordPress. You can use this if you already own a WordPress site, and would like to transfer it to your new DreamHost account. The transfer will be performed within 48 hours, during which you will not experience any downtime. MYSQL VPS: Finally, this is a more technical option, which ensures that your site’s databases are optimized and scalable. If you select this, your site will perform faster and be even more reliable. Once you’ve decided which of these options you’d like to add, select each one. You can then click on Continue once more, to proceed to the final step of the signup process. You have now configured your shared hosting plan to match your requirements exactly. At this point, you’ve reached the final step of the process, and all that remains to do is complete your purchase. On this page, you will need to enter your contact and payment details. At the bottom of the page, you can see a summary of your plan, including the total cost to you. If you want to change anything about your plan, you can do so by clicking on the links in the progress bar. As a reminder, you can find this bar at the top of the page. Once you’ve entered all the required details and are happy with your choices, select Place order now. Your order will now be processed, after which you’ll be the happy owner of a shared hosting plan with DreamHost! Once you’ve created an account with DreamHost and purchased a shared hosting plan, you’ll be able to sign in to your DreamHost panel. This control panel is where you can access all your plans, websites, and other features. Let’s take you on a quick tour of what you can do here. First, you may want to create an email address. You can do this by selecting Mail in the left-hand menu, followed by Manage Email. This will take you to the following screen. Click on Create New Email Address to do just what the name implies. You’ll see the following page, where you can configure your email account. 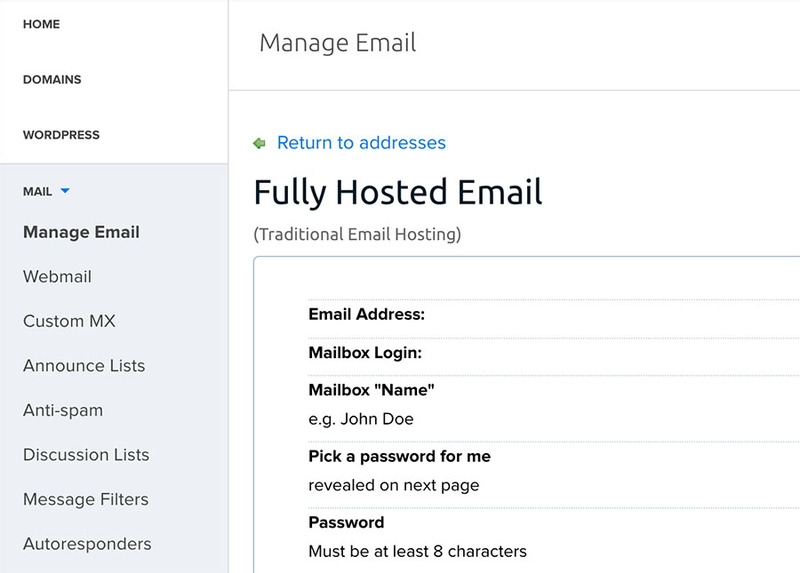 You can also create a ‘forward-only email address. This can be used if you want all messages to be automatically forwarded to one or more other addresses. You can do this by scrolling further down the page. What’s more, you can also create a ‘garbage’ email address. All messages sent to do this address will be automatically deleted. You’ll find this option at the very bottom of the page. However, emails are far from the only thing you can add using the control panel. Remember how earlier, we mentioned that you could set up a domain name after you purchase hosting? To manage and add domains, navigate to Domains in the left-hand menu, and select Registrations. This should look familiar if you completed the registration wizard. As before, you can search for domains you want to add and see if they are available to buy. You will also see related alternatives you may also want to consider. At this point, all you need to do is add the domains you want to your cart and purchase them. Keep in mind that there is no limit to how many domains you can add to your DreamHost account. With that, we’ll let you explore the rest of the DreamHost control panel on your own. There are still plenty of useful features to be found. For instance, you can add a free TLS/SSL certificate to secure your content or view statistics about your site. However, before we wrap up, let’s take a look at some additional resources that will probably come in handy along the way. If you’re anything like us, you could probably spend all day reading about WordPress. Whether you’re as obsessed as we are, or you just want to know more about how to use DreamHost and WordPress together, we’d like to leave you with some handy resources. The DreamHost Knowledge Base: To learn more about DreamHost, what features we offer, and how to use them, our knowledge base is your ultimate guide. Here you’ll find thorough and clear information, and support for any issues that may occur. DreamHost’s WordPress Guide: This free e-course is intended to help you learn how to use WordPress. It includes guides on everything related to the platform, as well as technical tutorials for developers and other advanced users. DreamHost Support: If you have any questions or need help with an issue, our customer support team is always there. They’re available 24/7 to help you out, and they’re so good at it that they’ve even won awards! You and your site couldn’t be in better hands. DreamHost Community: If you want to connect to other users, troubleshoot an issue, or discuss anything DreamHost-related, our forums are a great place to get started. WordPress Support: If you want to discuss anything related to WordPress, or need help with something specific to the platform, the official message board is another valuable destination. At this point, you should have everything you need to make your shared hosting venture a successful one. If you have a question or encounter any problems, you’ll want to check out our knowledge base first, along with the rest of these resources. When it comes to shared hosting, there are plenty of options out there waiting for you. However, by choosing DreamHost, you’re putting yourself in the very front of the line. The DreamHost shared hosting plan is the least expensive way to get your website out of your imagination and onto the net, without making any compromises in the process. Do you have any questions about DreamHost’s shared hosting, or how to get started? Let us know!